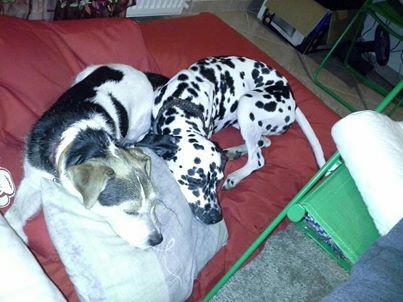 Last week brought a huge change into Maya’s life: a couple applied for her and their circumstances and attitude seemed to be perfect for our spotted lady. She has been looking for a forever home since August 2013, so we were head over heels when we got that particular phone call. They filled in our questionnaire and reading it we felt that this is going to be it! The first time we met, we were surprised to see such a fantastic consonence between Maya and her applicants. She cuddled from the first moment, which was far from her nature before. The couple is very spirited and they have a great knowledge about dog keeping, gained experience mostly with their Jack Russel whose energy level is quite similar to Maya’s. The two dogs made friends within minutes and soon they began to play with each other that afternoon. They live in flat, which was crucial in Maya’s case. She had a few applicants during the past 6 months but we couldn’t give them Maya because they all lived in family houses and as soon as she is in a garden, her Houdini-side comes alive and her mind begins ticking to find a way out of the garden… Now she lives in a flat, where she is safe and her new family takes her for long walks every day so that she can release her boundless energies. Soon they will attend a course at the dog training school, too. Milo, the little terrier welcomed Maya very well, which was really important for her because she loves being around dogs. She needs a friend at home whom she can play and wrestle with any time, so everything seemed to be ideal. We could hardly wait for the second meeting. And Maya? She greeted her applicants enthusiastically, which she’s never done before with people. We believe her sixth sense told her that this family was going to be the one for her and she can finally settle down. They went for a short walk in the park, Maya behaved perfectly on the leash and then played with Milo. This encounter gave us further positive feelings and we decided to give Maya to trial adoption by the end of the third meeting. We signed the trial adoption contract and thus the long waiting ended for Maya. She moved to her new home, where she can bathe in the love of her new family all her life. Maya’s dream of finding a forever home is coming true now, so if everything goes well during the period of trial adoption, we will be glad to sign the adoption contract. Her biggest advantage – compared to a puppy – is that she is absolutely flat-compatible and she is 100% house-trained. She would never ruin or steal anything in your flat, wouldn’t bark when left home alone, wouldn’t chew your shows or slippers, neither the edge of the table nor chairs or any other furniture. Only the sticks that she finds during the walkies. Maya was found by a family in the summer of 2012, when they went on an excursion to the woods near Orosháza. We put her ads to the net in order to find her owner but it brought no result. In the meantime the living conditions of Maya’s elderly caretaker changed, so we took the Dalmatian lady over. We visited the vet, where she received vaccinations and a microchip and a week later she was spayed. She spent the days of recovery in a fosterhome but when she got rid of the cone after the stitches had been removed, it turned out that this loving girl has a bad habit: getting through the fence no matter how. We recommend her for a person/family with a flat or a family house with a concrete-based strong and high fence. Living in a family house with a garden could be a bit more difficult, because she can roam in the garden only under strict supervision. This way we can avoid to let her find a way out. Apart from this habit, Maya is a very sweet and clever dog. She is smaller than the average Dalmatian females and her shorter nose makes her look like a naughty puppy – oh, and she smiles all the time! Due to her young age, she is full of energy so she needs time and space to get rid of her excessive energies. She loves running but she can be let free only in places (e.g. wast meadow), which lie far from the traffic. Swimming is another favourite activity of hers, she just loves splashing in the water and jumping in it up and down. Maya pays attention to her caretaker, incoming works most of the time but she needs some more practice. She knows the leash but she’s drown to discover the world, so she easily forget that there is someone walking on the other end of the leash. She learns fast and she can be easily motivated with a few treats. However, she loves her tummy too much, so it is recommended to pay attention to her daily portion. She behaves well in the flat, she stays silent whatever happens. She doesn’t ruin, chew or steal anything. She usually takes a rest on her own pillow/bed until it’s time for the next walk. Maya is house-trained. Travelling by car is okay for her. She gets along well with other dogs, she’s curious to meet them, their size and gender doesn’t matter. She is also friendly with cats. Maya is waiting for someone or a family who will love her and take care of her for the rest of her life. A forever home, where she is treated as a real member of the family, where she can go for long walk together with her beloved people and sleep on a comfortable dog bed when she gets tired from running and playing with other dogs. Maya can be adopted from our organization with an adoption contract, signed after previous meetings in person. Fortunately, she was not pregnant but the vet confirmed that the young Dalmatian lady had given birth to puppies before. She got through the surgery together with her caretaker’s own female dog. They coped with it very well and during the period of recovery the dogs had no chance to “cure” each other’s wounds with the cone around their heads. Maya gets more and more comfortable in her fosterhome, she discovered that playing with other dogs can actually be fun. What she needs now is a loving family who will take good care of her forever. Sweet Maya is waiting for your applications at info@dalmatamentes.hu (MAYA). Maya is vaccinated, dewormed, microchipped and received a a spot-on. We paid 22.000 Ft (~ € 75) for her surgery at a discount price. Please, support Maya’s veterinary costs and everyday care so that we can help more rescue dogs in need. Every cent you give to our organization is turned to cover the costs of our rescue dogs.